I got into a debate about democracy in the greater Middle East (many geography buffs would object to my including Afghanistan in the Middle East instead of Central Asia) with Mister Ghost, a co-host of Iraqi Blogger's Central and with Paul Edwards, host of Anti-Subjugator. They both challenged me with their views (which are not identical), so I thought I would summarize my views on why the United States is correct in preferring democracy over a Westernizing strongman in Afghanistan and Iraq. Let me start by admitting that democracy isn't my favorite regime. I prefer a limited role for government in the economy and politicians always have a hard time delivering on this agenda. Occasionally I get tired of hoping that the right politicians will get elected and enact all of my pet causes into law. A free-enterprising strongman superficially might seem like the solution. But then there are some people I know for whom the pro-life/anti-abortion issue means almost everything. Rather than wait for another round of election returns hoping for a pro-life Congress, President and federal courts, they might want to cut corners and establish a pro-life strongman. And then there are the environmentalist people who have become impatient waiting for tougher fuel efficiency regulations on cars and SUVs. They fear global warming. So, they want a green strongman. If we all tried to enact our political agendas by setting up a strongman who agrees with us, we would have one messy civil war. In fact, that's exactly what America had when many Southern planters were more committed to their investment in African-American slaves than they were to democracy as a principle. Afghanistan Iraq are currently suffering from low-level civil wars because certain factions are more committed to their political agendas than towards democracy. In a democracy we do not have to agree that the elected government always makes wise or even moral choices when it comes to enacting and enforcing law. It simply means that people who disagree on policy issues settle them in the court of public opinion instead of civil war. The strongman that people think of most often is Kemal Ataturk, the founder of modern Turkey. But there is a reason why he is often the only example of a westernizing dictator mentioned. No other Middle Eastern dictator was truly successful in westernizing his country while staying in power. The Shah of Iran did westernize Iran before he was overthrown in the 1979 Islamic revolution. Thus, the largest obstacle to setting up a westernizing strongman in the Middle East is that he has to rule harshly enough to remain in power, lightly enough to allow freedom to take root. It's a tightrope that is nearly impossible to walk. If maintaining freedom while enforcing law and order are so difficult for a dictator to do simultaneously, how do democracies do it? It's called "legitimacy." Simply by getting elected a politician has demonstrated that his views are reasonably representative of his constituents. So, the number of people likely to disobey the law because they disagree with it is already reduced to some extent because the laws reflect (however imperfectly) the attitudes of preferences of the people. In addition, when people have an opportunity to participate in the making of law (by voting or voicing their opinions or holding elective office) they believe they have a stake in the democratic system. Thus, those citizens, policemen, judges and prosecutors are who disagree with the law and the politicians holding office are more likely to be cooperative. The pro-lifer who doesn't bomb an abortion clinic, the environmentalist who doesn't vandalize SUVs, the guy who prefer lower taxes who doesn't scheme to blow up an IRS office, they are the people who keep a democracy from descending into civil war. In a dictatorship these people described above have no electoral contest to which to look forward. President Bush presents his policy of supporting democracy in Iraq and Afghanistan as the harder choice but one that is true to American values. This is seems to be true. But when America topples a dictatorship, planting a democratic regime in its place is actually a pragmatic choice and the one that is most likely to lead to stability. Where stability was previously purchased by brute force in Afghanistan (under the Soviet puppet dictator and later the Taliban) and Iraq (under the Saddam Hussein regime), these nations are currently attempting to obtain stability through the legitimacy of the democratic process. After some dithering, some sanctions are imposed. They consist of an embargo on #2 lead pencils. We really push Russia and China, and agree to add protractors and rulers to the list. The Iranian rulers announce that the sanctions will have no effect on their nuclear program. Western leaders respond by saying that if Iran does not behave they will issue an even sterner warning. In 2008 a Democrat is be elected to the White House. Tony Blair loses a confidence vote in the House of Commons and is replaced by a Labor Party leader who was known for his anti-George W Bush rhetoric. The new American president announces a "grand bargain", which will be presented to Iran. She says that terms of the bargain are simple; if Iran agrees to give up their nuclear weapons program, we will shower them with all sorts of economic benefits, as well as diplomatic recognition. The Iranian rulers pretend to be interested and will agree to talks. They also announce that regardless of what happens they will continue their nuclear program. Nevertheless, the American president agrees to talks, which drag on for months or years with no visible progress. All the time the United States insists on getting UN Security Council approval for each step. While this strategy seems to give us the "worldwide unity" we seek, it also has the additional effect of making us beholden to the council, and gives it a certain legitimacy. Eventually, even the Democrat US president tires of Iranian stalling, and asks the Security Council to rachet up the sanctions. Almost all countries on the council refuse to consider anything beyond adding ball point pens to the list of prohibited items. Sometime towards the end of the decade, it becomes clear to American intelligence that Iran is close to building a nuclear bomb. The president makes some of the information public and asks for congressional approval. Congressional Democrats, in the majority of both houses, refuse. They publicly doubt the intelligence, with "remember Iraq" as their battle cry. Besides, they say, we need approval from the UN Security Council. The American president considers consults with the permanent members of the Security Council. Every one says that they will veto an American proposal to use force against the Iranians. Israeli intelligence sees the same thing that American intelligence does. The Israelis go to the Americans and say that they will strike if America does not. The American president not only refuses to strike Iran, but says tells Israel that if they do they will face serious consequences, up to and including a total cutoff of American aid. The American president assures Israel and the world that she has received "assurances" that Iran will not use it's nuclear weapons offensively. Faced with a cutoff of aid, Israel backs down and decides not to act. Iran conducts a nuclear test. The Muslim world goes wild with approval. However, Iran does not use it's weapons. Perhaps Ahmadinejad is no longer in power, the mullahs restrain him, or the prospect of a nuclear retaliatory strike by Israel gives them pause. Egypt, Turkey, and Saudi Arabia announce that to assure their security, they have started their own nuclear bomb programs. Other countries in the region hurry to ally themselves with someone who has or will soon have nuclear weapons and shows the desire to protect them. None approach the United States. Iran obtains nuclear weapons, and gives one to a terrorist organization. Because Israeli security is now unbelieveably tight, the terrorists are only able to sneak it up to the border. They detonate it there, which kills several tens of thousands of Arabs and Israelis (a ground blast being much less effective than an air burst). Muslims the world round go wild with joy, and excuse the death of so many fellow Muslims by saying that they are martyrs who are now assured a place in paradise. World leaders, including the American president, urge Israel to "show restraint". Because "only" one bomb is used, and they are facing so much pressure from the "world community" to "show restraint", Israel's response is limited to a retaliatory nuclear strike of a single nuclear weapon against iran, coupled with conventional attacks by its F-15s and F-16s. The Middle East goes nuts and everyone except for a few American conservatives (and 2 Belgiuns) blame Israel for it's "disproportionate response". As with the middle case scenario, this may develop in one of two ways. However, in the end the result will be the same. The first way this begins is with a conventional Israeli strike, designed to take out Iran's nuclear facilities. Because Israel does not have the detailed intelligence that American assets can provide (the American president having refused to share), and because they do not have the quantity or quality of weapons that the Americans have, they are unable to signifiantly delay the Iranian acquisition of nuclear weapons. After one or two strikes international pressure is such that Israel backs down. The second possibility is that Israel does not strike at all, and in a moment of weakness accepts assurances from the American president that she has received assurances from Iran that despite what they say publically every other day they will not actually use them. Assurances are everywhere. Either way, Iran obtains nuclear weapons and begins to build up an arsenal. Because they have secretely obtained technical information from North Korea and Pakistan(the latter through scientists working independently from the government), they are able to mount a few on top of missiles. Out of the blue Iran strikes Israel with over a dozen Shahab-4 missiles armed with nuclear weapons. Israel, on the alert, launches its Arrow II anti-missile missiles. Most incoming Shahabs are destroyed, but a few get through. Because Iran has targeted Israeli cities, losses are high, with three million Israelis become casualties almost instantly. Israel retaliates with nuclear armed Jericho 2 missiles, F-15s, as well as Popeye Turbo missiles fired from Dolphin-class submarines prepositioned in the Persian Gulf. Israel concentrates it's attacks on military targets, since it fears more attacks from Iran. Being a small country, Israel cannot absorb many blows, and 40% of it's population is already either dead or seriously injured. The Middle East goes nuts and everyone around the world except for a few American conservatives (and 2 Belgians) blame Israel. In retirement at his ranch in Texas, George W Bush mutters that he wishes he'd struck Iran when he had the chance. A few American conservatives (and 2 Belgians) agree. I don't remember exactly how it came up in conversation. I guess it was just that we had been talking to a couple of soldiers just back from the war that prompted it. Either way, we were outside of Walter Reed Army Medical Center in Washington DC, and were walking down to where the Code Pink people were. The soldiers had gone down there to confront engage in dialogue with them (details here). Either way, I made some comment about how the situation in Baghad was pretty grim. My compatriot turned to me and said something like "oh but we've been making progress recently!" Before I could say anything, the moment ended. We got to where we were going, someone else spoke, and the conversation went elsewhere. If I had been able, I would have said something along the lines of "Oh come on. Here we are 3 1/2 years into the war and you're telling me cheerfully that "we're making progress in the capital city"? " In Losing the War I said that we were losing the overall war against Islamic fascism (I encourage you to read it simply because several commenters made some very astute points). In this post I'm going to say that we're losing the war in Iraq. Before my pro-war readers freak out, be assured that one, I think we can still pull it out, and that two I still think it was a good idea to invade. Before any anti-war readers chortle with glee, ask yourself why it makes you happy to read that I think we're losing. 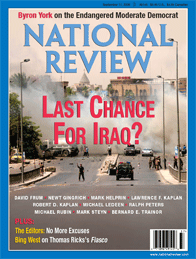 The editors and writers of National Review have supported the war from the beginning, and do so today. But like me, they have come to be more and more alarmed with the state of affairs in Baghdad. As such, they gathered 10 military experts, geopolitical thinkers, Middle East scholars, and conservative writers for a symposium and asked them two questions: "Are we winning; and, if not, how can we?" You can read their responses yourself in the September 11, 2006 edition of the magazine. If you pay for a digitial subscription (free with a subscription) you can view it on-line. And shame on you if you don't subscribe. The participants are David Frum, Newt Gingrich, Mark Helprin, Lawrence Kaplan, Robert Kaplan, Michael Ledeen, Ralph Peters, Michael Rubin, Mark Steyn, and Bernard E. Trainor. None of them think we're winning, with the possible exception of Mark Steyn, who offered a tepid "Iraq will be mostly all right". Most of them think it's salvagable, though barely so. All offer wise words of advice. Over the last two years, the U.S. has done nearly everything it thought might undermine the insurgency in Iraq and stabilize the country. We held elections that demonstrated the desire of most Iraqis for a better future. We brought Sunnis into the legitimate political process and fostered the creation of a unity government. We killed the leader of al-Qaeda in Iraq, Abu Zarqawi. We built an Iraqi army that, for all its flaws, will stand and fight. We pushed aside the ineffectual prime minister Ibrahim Jaafari to make room for his replacement, Nouri al-Maliki. We did all of this, yet the violence is as bad as it has ever been. Attacks on American troops are up. Attacks on Iraqi forces are up. Attacks on Iraqi civilians are up. Iraqi civil society gives the impression of teetering on the edge of collapse. People are afraid to go to mosques, for fear of the horrors that regularly transpire at them. Bank officials depend on stealthy deliveries of cash in private cars, for fear of the brazen robberies that regularly befall armored vehicles. People hesitate to open their doors to the police, for fear that they might actually be militiamen prowling the streets with power tools to torture their victims. Mourners can’t even collect corpses at the Baghdad mosque free of fear that they will be killed while doing so. The middle class is fleeing the country, and both Shia and Sunni are beginning to leave mixed neighborhoods to escape sectarian violence. Militias exist to impose through force what they cannot win through the ballot box. Iran exerts its influence through militias, and the U.S. fails to counter them. Left alone, they metastasize. The hoped-for unity government is fractured along ethnic and sectarian lines, with each group advancing its own agenda. Even in a bureaucratic sense it is not working. Corruption at all levels is endemic. Violence is at an all-time high and getting worse, with Iraqis being killed at the rate of 3,000 a month in the internecine war. The sectarian vigilantes and mafias are running wild. Iran clandestinely supports the Shiite militias. Expectations of success in the much-advertised program to restore security to Baghdad are questionable, given past failures. We have not mastered the insurgent way of war, and do not have enough troops in Iraq to “clear, hold, and build” in insurgent-dominated areas. Daily strikes against coalition forces have doubled since January. The Iraqi army remains pitiful, and the police are not only ineffective but untrustworthy. Efforts to put the country’s economy in working order are crippled by insurgent attacks, looting, and corruption. Will 4,000 U.S. troops redeployed from elsewhere in Iraq suffice to do the job? I don’t know anyone who thinks that they will. Not for the first time, we are left to wonder: Does the Bush administration truly believe Iraq is as important as it says it is? A good case can be made for ramping up troop numbers dramatically. A good case can also be made for drastically reducing them, leaving behind a force of Marines and special-operations soldiers embedded in the Iraqi security services: a classic im¬perial model. Much weaker is the case for what we are doing presently: for example, robbing Mosul of troops in order to move a few thousand to Greater Baghdad. Mosul, though it has made significant progress since 2004, is by no means secure. What to do? First, recognize that the Iraqi enterprise rested on a failure of strategic vision: It was never possible to secure Iraq so long as Iran and Syria were left free to wage terror war against us. Our military, and some Iraqi units, are terrific, but you can’t win a regional war by playing defense in one place. It is, as I have said ad infinitum, a sucker’s game. Ergo, work for regime change in Iran and Syria, the only way to win the war. I could go on but you get the point. As I said above, buy the magazing or get a digital subscription and read the whole thing. A few weeks ago I wrote a post about a round table discussion in Foreign Affairs, in which several participants posed ideas on what to do to win in Iraq. I didn't necessarily agree with their ideas, but it was as useful exercise in that what we're doing now isn't working. Most of the participants in the NR symposium urged the administration to commit more resources, especially troops. Their basic argument is that for some weird reason the administration is trying to win the war on the cheap, and that if we tried harder we would be successfrul. Unfortunately, it may be too late. Michael Rubin in particular said that we're losing primarily because neither the American people nor our politicians (GOP as well as Democrat) are not committed to winning, and took the administration to task for not making the case for war more strongly. If it is true that adding this relatively small number of troops to Baghdad is significantly improving the situation there, can you please tell why in (you know where) it has taken us so long to do this? To be sure, the issue of additional troops is more complicated than many seem to imagine, as I pointed out in a post last year. Nevertheless, it's still a good question. Perhaps the most frustrating, and strangest, aspect of all this is who we're losing to. It's not a defined enemy, one with a headquarters or capital city. We're losing to chaos, to the Iraqis themselves, to Iranian and Syrian subsersives, to sectarian and tribal violence. Al-Qaeda is not going to take over if we pull out. A Milosevic-type fascist who wants to "cleanse" the country of Sunnis might. Anti-war types will say that we were losing from the start. Some pro-war types always say that "things are improving". Both are wrong. Neither seem to realize that there is an ebb and flow to wars, that it usually goes back and forth between who is winning and who is losing. Now is not the place for a full summary, but suffice it to say that we were winning in early 2003, losing by the end of that year and in 2004 ("What Went Wrong", October 2004), we started to win again in 2005 ("We're Winning", April 2005), but in the past 6-8 months things have taken a decided downwards turn. As the editors say, " In the end, there is no excuse for losing a war". The GOP has controlled both houses of congress since before the war began. The media may be an annoyance, but Reagan got around it, and he didn't even have the House. The Democrats may be a bunch of political opportunists, for the war when it was popular and against it when not, but they're essentially out of power. Our problems seem therefore to be twofold; one, we will not commit the resources, and two, the administration will not make the case. It's not as if we don't have the money. I don't have the figures in front of me, but we all know that the Republicans in congress have been spending money like there's no tomorrow. President Bush encourages their irresponsible behavior, refusing to veto any spending bills whatsoever. What makes it all so bad is the reason for all the spending; the GOP is trying to buy votes. At least when liberals spend money they do it out of principle. When it comes to most Republicans, they do it just to keep their seats. So rather than build another carrier task force (we're down, I think to 12, a post-WWII low), reconstitute an Army or Marine Corps division or three, build more F-15s, or ramp up our intelligence assets, they spend the money on pork-barrel projects. The U.S. is losing in Iraq because American politicians and the general public have not decided they want or need to win. Many congressmen look at Iraq through the lens of the 2006 election: They care neither how their words embolden the enemy nor how their grandstanding impacts Iraq. Again, yes the Democrats are not being helpful. But they're not in power. Anywhere. The fact is that the administration went on vacation shortly after our success in smashing the Ba'athist regime and never quite came back. Reforming Social Security was a laudable goal, but not at the expense of taking attention away from the war. If Bill Clinton was in office he'd be out making the case for war every day. He'd be visiting a military base or hospital, shaking hands and making sure the photo ops went as planned. He'd make sure that every week there was some piece of legislation designed to help win the war for him to sign, and would arrange for a full-blown press event to ensure maximum publicity. By comparison, this administration is woefully incompetent. (The United States) has acquired the habit either of losing wars or of ending them inconclusively. A similar result in the Middle East would lead not just the Chinese, Russians, and Iranians but also the Norwegians, Singaporeans, and Australians to conclude that the nation's hyperpower status was some freak accident — like Jerry Lewis stumbling into a boardroom meeting and being mistaken for the new chairman. They would make their dispositions according, there being no reason why anyone should take Washington seriously ever again. If the Democrats think that's good for the world, I'd like to know why. Is anyone in the administration listening?